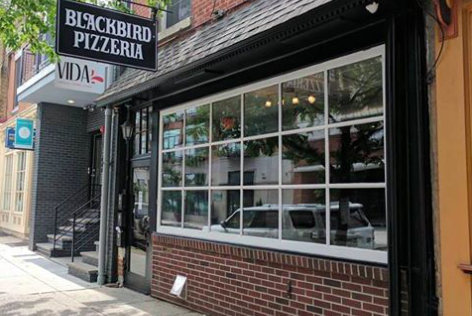 Blackbird Pizzeria has opened a second location at 614 N. Second St. in Northern Liberties. Blackbird Pizzeria, one of the stalwarts of Philadelphia's vegan restaurant scene, officially opened its second location in Northern Liberties on Wednesday night, adding another pizza option to a busy strip of Second Street. Two Philly restaurants made Food & Wine list of best pizza places in U.S.
PhillyVoice rounded up a list this week of the best places to get pizza around Philadelphia, and everyone proceeded to yell at us on Facebook. We kind of sort of left out this gem simply because too few people realize vegan pizza is fantastic — and a good deal healthier than the alternative. Blackbird's pizza uses Violife, a coconut-based cheese imported from Europe and only available wholesale to restaurants. They have an extensive menu with lots of seitan and tofu options heavy on the veggie toppings. They also sell wings, sandwiches and salads. The Philly cheesesteak even comes with vegan whiz. The $2 slices have come and gone with the soft launch, but the popularity of the South Philly location, established in 2010, bodes well for Blackbird's second home at 614 N. Second St.
My pick on that pizza roundup was right up the street at Rustica, and there's also the wood-fired Spuntino, so now you'll never be without a place to keep your pizza life varied on Second Street. Blackbird is open seven days a week from 11 a.m. to 10 p.m.